Xoo - "Poison In The Name Of Beauty"
Do you like Hawkwind styled Space Rock? If you like bands that follow the general Hawkwind mold you will absolutely dig Xoo. Based in the UK, at least two of the members (Kevin Perry and James Hodkinson) have long been in the Hawkwind tribute band Assassins of Silence. 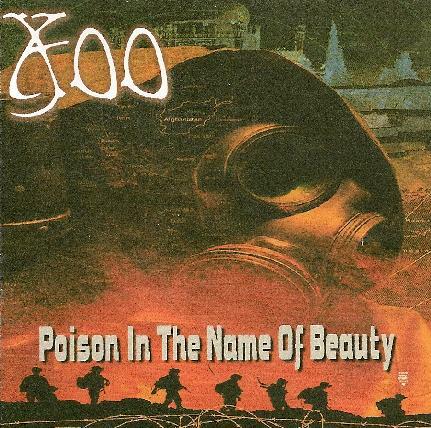 Poison In The Name Of Beauty is Xoo's first album and includes 9 songs that bring with them all the trademark Hawk inspired Space Rock elements - sci fi & hi-technology lyrics, spoken word voices mixed in with the singing, electronics… and these guys ROCK. Xoo kick things off on a high note with the heavy rocking "Call of the Profit". James Hodkinson's bass gives the music an Alan Davey sound, and Kevin Perry's guitar cranks out ripping solos, the kind that of all Hawkwind guitarists we would have only heard from Huw. "Song of the Sandman" features a great combination of song and floating cosmic drift. "Poison…" is an emotionally powerful instrumental, with intense drumming, metallic guitar chords, and symphonic prog characteristics. "Dark Matter" has a "Damnation Alley" groove that I enjoyed. Excellent song. "Queen of Angels" is one of my favorite tracks on the album, having a glorious Kosmiche space-prog sound. And there's a lengthy stretch out instrumental segment where the band wrap dreamy drift, potent rock and genuine passion into a nifty cosmic package. Outstanding. "She Ghost In The Machine" and "Merchant of Venus" both have a cool bouncy rock 'n roll groove and fun lyrics, with the latter including some crunchy metal riffage. And "SETI" is another highlight, with a great melody , rocking groove, excellent heavy guitars, and outer space synths. An impressive album, and it was the well written songs and melodies that kept me coming back for repeated listens.